Belkin may be better known for its huge range of mobile, computer and networking peripherals, but it isn’t afraid of dabbling in the world of audio electronics. The Song Stream BT HD is a neat-looking Bluetooth DAC with NFC (near-field communication) built in. Those running Android 4.1 or above can pair by resting your handset on the rubber pad on top of the DAC. Those of you running earlier versions will need to nip over to the Google Play store and download the Belkin BT app before doing the same. 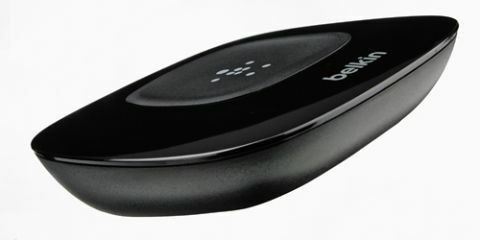 Those that don’t have the luxury of NFC can just pair in the normal way – a small speck of blue LED light just above the Belkin logo shows you’re connected. The Belkin has a 3.5mm analogue output (complete with 3.5mm to RCA cable), but you are also presented with both optical and coaxial digital outputs (you’re given a coax cable in the box). We haven’t come across any other Bluetooth DACs that offer this breadth of connectivity, but if your amp or external DAC has either of these inputs, you’re in business. There’s a confident swagger to Lady GaGa’s Do What U Want. Bass notes sound firm and hit with purpose. They’re defined and extend relatively deep. The Belkin’s delivery is effortless and does a decent job of capturing emotion in vocals and following rhythms accurately. The DAC makes for a really inoffensive sound without coming across as dull or lacklustre. Compared to the vibrant Crystal Acoustics BluDAC, the Song Stream does sound a little condensed and closed-in, but you could still happily have the Belkin connected in the background and not feel like you’re missing out. For the money you’re getting a very listenable DAC, but the very best at this price can go that extra mile when it comes to sound quality.